Eggs… or shall I call them Incredible Eggs. Why Incredible?? Because, One egg has 13 essential nutrients in varying amounts – including the highest quality protein, choline, folate, iron and zinc – for only 75 calories. 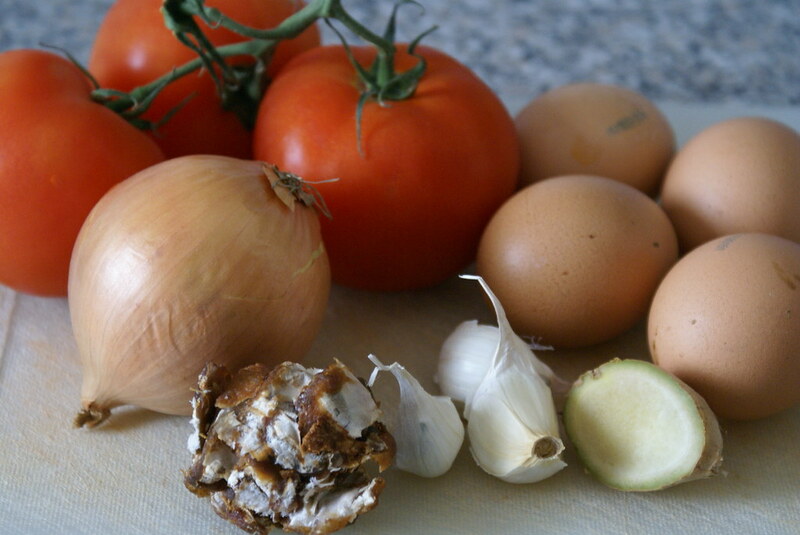 Eggs also play a role in weight management, muscle strength, healthy pregnancy, brain function, eye health and more. Inexpensive, convenient and delicious, eggs are the perfect choice for the entire family. They can be prepared quickly in a variety of ways to suit everyone’s taste buds. Boil eggs and remove the shells and keep aside. Blanch tomatoes in boiling water for 10 mins. Cool and grind. Pass it through a seive to get fine puree. Grind ginger and garlic. (Alternatively you can use 1 tbsp of GingerGarlic paste). Soak tamarind in warm water and extract the pulp. Add all the ingredients for tadka. After they splutter, add the finely chopped onions and turmeric. Fry for 5 mins and add ginger garlic paste. Fry for few more mins, and add tomato puree. Add salt, red chilly powder. Mix and cover. Now add tamarind pulp, garam masala. Simmer for 10 more mins. Garnish with corriander and Serve hot with Rice. Hmmm mouthwatering, Spanz… I always love in gravy based recipes and fried ones… this looks so yummy esp with hot rice, How r u doing? 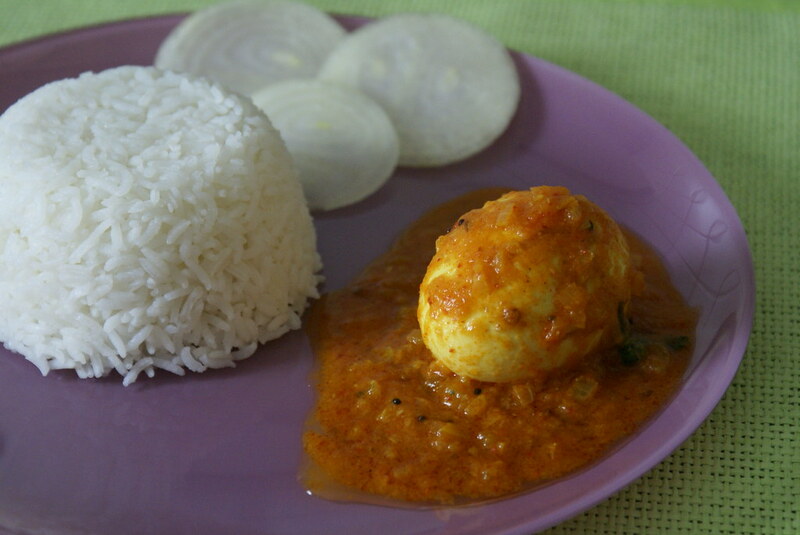 The egg with rice simply look awesome. first time to ur blog. I wud love to try ur mirchi bajji. And ur egg recipe look yummy. Loved those pics…make me hungry. 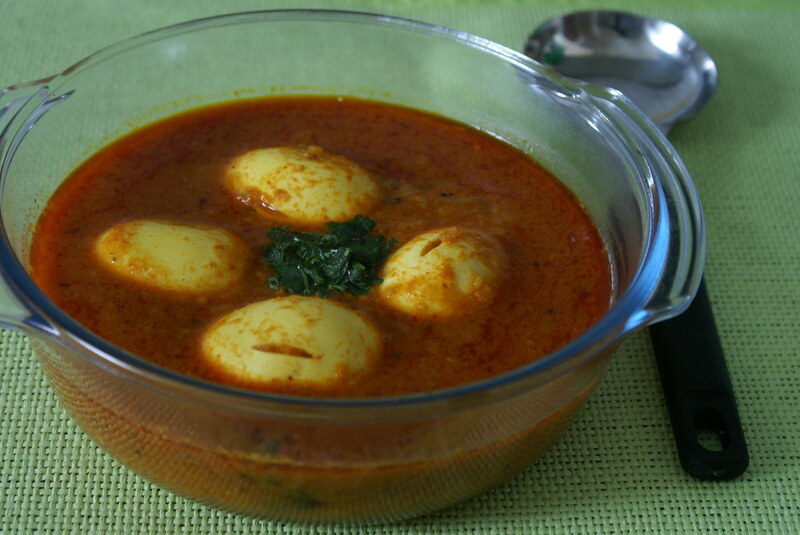 YIPPEE..another egg curry for me to try..Looks delicious..
Sam, Saw ur post too, that was very yummy post… shall try ur recipe and let u know! Sonu, Try those mirchi bhajjis.. they taste really good, and let me know how u liked them. I still have never eaten a boiled egg this way, but it always looks so good… I really want to try this soon!